Samsung workers in South Korea who have suffered serious health problems have been flooding a website set up to handle requests for compensation after a mediation agreement — the result of a decade-long fight by Samsung employees and their families — was signed late last year. "It is hard for Hye-kyung to climb stairs and go up and down all the time," said Kim Sinyeo, her mother and caregiver. The 40-year-old has lived with a disability since 2005, following a surgery to remove a brain tumour. She can't walk, has blurry vision, body tremors and a speech impediment. Han and her mother say the tumour was the result of her six years working in one of Samsung's chip and display factories in South Korea. "I am really unable to do anything without my mother. I really can't," Han told CBC's The Current. "That's why I pray to God to let me die with my mother." A spokesperson told The Current that Samsung will make changes and review "67 recommendations from an ombudsman committee to better manage health risks in the workplace environment going forward." The company said it plans to do research to determine if there is a connection between the work environment and the illnesses. Samsung apologized in November, acknowledging that it had failed to "sufficiently manage health threats" to its local factory workers. The company's apology was part of an agreement to compensate sick workers and the families of those who died. Under the agreement, payments will be made for blood disorders, cancers, pulmonary conditions and brain tumours suffered by employees who have worked at Samsung's chip and LCD factories since 1984. The compensation also covers miscarriages and congenital illnesses of the workers' children. The top payout is 150 million won ($175,300 Cdn). 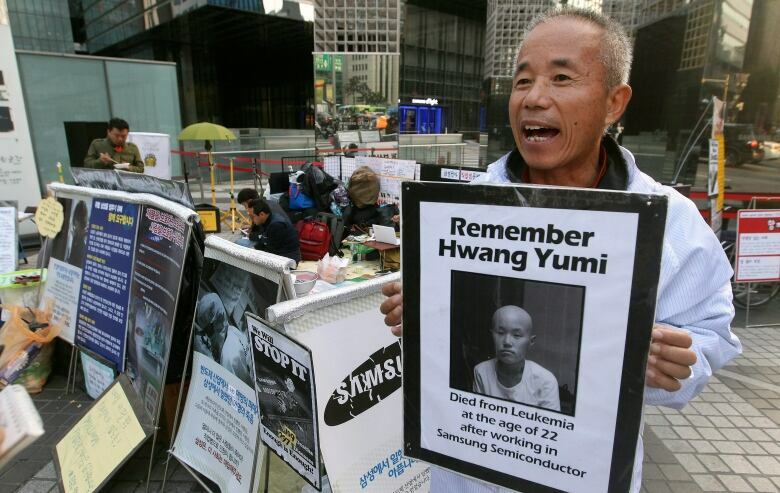 "Compensation is important, but what is more important is prevention," said Hwang Sang-ki, whose daughter, Yu-mi, died of leukemia in 2007 after working at Samsung for just 2 ½ years. "We need to strengthen work safety laws to ensure that workers and others know what kind of substances they are handling and give them the right to know." Many say the compensation wouldn't have happened without the dogged efforts of Hwang. In South Korea, Samsung is everywhere. It builds ships and buildings, sells life insurance, owns an advertising agency and the country's largest theme park. Samsung's presence is so pervasive that locals say they live in "the Republic of Samsung." So when Hwang took on Samsung after his daughter's death, it was like David taking on Goliath. He fought Samsung in the media and the courts over its refusal to acknowledge that its employees were getting sick from their work environment and the chemicals used at the factories. "I did not have any strong evidence, clear evidence," Hwang said, "but one thing that I clearly felt was that Samsung had deceived me." Hwang believed it was chemicals used at the plant that gave Yu-mi leukemia. He became more convinced of the link when he learned that his daughter's workmate had died of leukemia within months of her diagnosis. 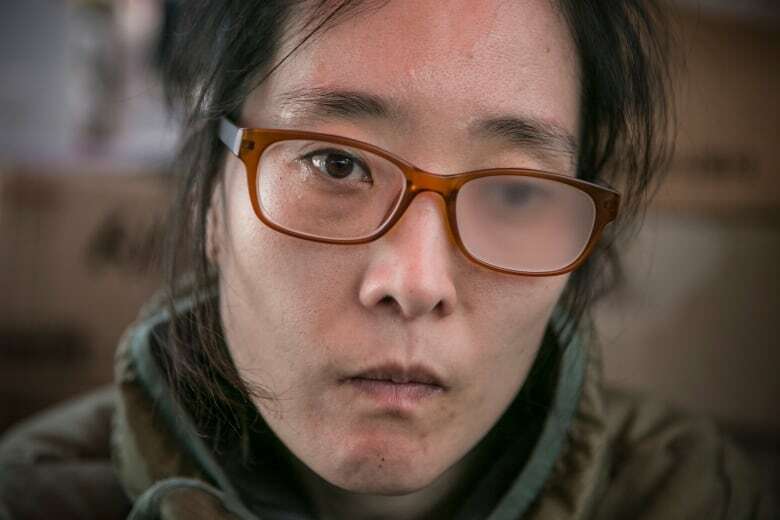 "People usually think occupational disease can appear only in a very dirty, really nasty, filthy factory," said Dr. Jeong-ok Kong, who is part of the Supporters for the Health and Rights of People in the Semiconductor Industry (SHARPS), a South Korean activist group founded by Samsung workers, occupational health professionals and unions. "But now people know occupational cancer and other diseases can be induced by this so-called clean industry." Working alongside unions, NGOs, doctors and lawyers, Jeong-ok and SHARPS created a database in 2007 to document workers' accounts of their illnesses. In 2008 they began filing workers' compensation claims with the government. But one after another, the claims were rejected, including the claim filed by Hwang on Yu-mi's behalf. In 2010, SHARPS appealed Yu-mi's denial to the courts. The group got lucky when someone leaked an internal Samsung document that contained a list of chemicals used in the area of the plant where Yu-mi had worked. A toxicologist testified about the toxicity of the chemicals, and the court overturned the workers' compensation decision. The decision was appealed by Korea Workers' Compensation, but in 2014 the decision to award compensation was upheld. For the first time, an official body was saying chemicals the workers handle could be making them sick. Korea Workers' Compensation and Welfare Service began reviewing old leukemia claims and accepting new ones. It wasn't long after that Samsung began talking to the families and SHARPS about compensation. In 2014, Samsung CEO Kwon Oh-Hyun issued a public apology. "We feel regret that a solution for this delicate matter has not been found in a timely manner and would like to use this opportunity to express our sincerest apology to the affected people," Kwon said. The apology did not admit a connection between illnesses and the workplace, but Samsung went on to create a compensation fund of 100 billion won ($132 million Cdn) and invited SHARPS to be part of the decision-making. The collaboration didn't get very far. SHARPS felt Samsung put too many restrictions on who would be eligible and what diseases would be covered, and rejected a December 2015 deadline to apply for compensation. Talks broke down, and the outraged workers decided to take the fight to Samsung's front door. On Oct. 7, 2015, a sidewalk sit-in began beneath Samsung's four towering skyscrapers in downtown Seoul. Photos of women and a few men — all Samsung workers who were either sick or dead — were displayed. A large papier mâché figure of Hwang's daughter Yu-mi became the mascot of the protest. In response, Samsung stationed security guards outside the buildings to keep watch on the demonstrators. In July 2018, approximately 1,000 people made a chain around the Samsung buildings to mark 1,000 days of protest. Samsung approached SHARPS the next month, saying it was willing to restart the conversation about compensation. The company agreed to let a mediator set the terms, which would be binding. Two weeks later, the sidewalk protest was dismantled. The mediation report came out in October 2018. A month later, there was a signing ceremony with an apology from Dr. Kinam Kim, president and CEO of Samsung's device solutions division. He acknowledged the company had neither sufficiently managed the health risks nor responded soon enough. "We offer our sincere apology to our workers who have suffered with illnesses and their families," he said. "From this, Samsung Electronics will place a greater focus on providing a much safer and healthier workplace." Hwang Sang-ki signed for the workers and their families, but his remarks made it clear they were not ready to let Samsung off the hook. "No apology would be enough considering the deception and humiliation we experienced from Samsung over the past 11 years, the pain of suffering from occupational diseases, the pain of losing loved ones," Hwang said. Hwang also reminded Samsung of the outstanding issue of releasing information about the chemicals used in the electronics plants. But he says he's proud that he was able to keep his promise to Yu-mi to prove that her leukemia was caused by her job and to get Samsung to pay compensation. "She would be happy and she would tell me, 'You did a good job,'" he said. Han Hye-kyung is also proud of what they accomplished, but she says the victory won't make her body whole again. 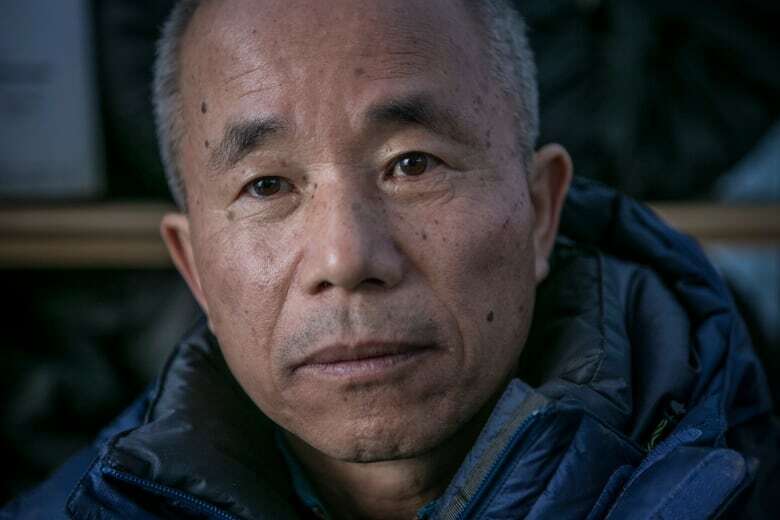 "I supposed when I get the compensation life will be a little easier than before, but my body is already so destroyed," Han said. "I don't know what more there is in store for me." Written by Sandra Bartlett. Produced by Sandra Bartlett and Liz Hoath.